Remember the Honda FCX Clarity? Unless you live somewhere near Torrance, Calif., you probably don't. 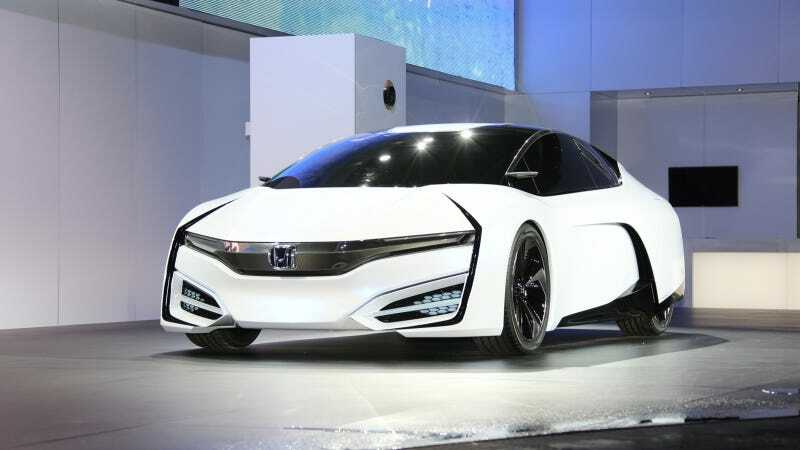 But if you're one of the few customers who've gotten your hands on Honda's fuel cell experiment (and most of them were in the audience for this), prepare to be amazed in 2015 when a version of the FCEV Concept goes into production. The concept shown in LA is essentially previewing Honda's third stab at fuel cell technology and underscoring the fact that they're not giving up. In fact, this is a seriously good looking car. Futuristic is definitely an overused term when describing concepts, but it applies here. There's some VW XL1, but again, not a bad thing. It has a mean, slashy face that's kind of cool, too. Honda says the FCEV has a significantly more efficient fuel cell pack system than the outgoing FCX, making it a third smaller. They anticipate a driving range of more than 300 miles and a refueling time of about 3 minutes. Just like a Civic, really. Speaking of Civics, doesn't the back of this look like the European Civic's rear that's been squished? All Hondas should look this good. In fact, it looks so good that Honda just needs to make it. Just with one of those fabulous turbos you're talking about making. Yeah, a three-pot turbo pointy Honda is just what the world needs. Right now.